Every war must end, but few end well. Fred Charles Iklé has written a slim but essential book on this subject. Fred’s bottom line: government leaders that make momentous decisions to go to war, or decisions that could lead to war, are obliged to have military and diplomatic strategies to end hostilities on favorable terms. American forces must not be committed to combat without a clear military strategy, whether for defeating the enemy of for expelling the aggressor’s forces and restoring the peace. A third lesson tells us that the United States should not enter a war based on a strategy of inflicting ‘punishment’ on the enemy by bombing or shelling targets whose destruction will not serve to defeat the enemy’s forces militarily. Fred is no longer with us to offer his views on bombing Iran’s nuclear sites, controlling Syria’s air space, dealing with the Assad regime’s chemical weapons, or how best to respond to Kim Jong-un and his coterie of military advisors. The particulars in each case are different. One relates to proliferation prevention, the second focuses on the use of force on humanitarian grounds, and the third deals with the consequences of proliferation. Caution is a tactic, not a strategy. Caution can either help avoid dangerous, precipitous, and costly moves, or it can make a bad situation worse. The most successful strategies to date in dealing with the consequences of proliferation have been deterrence and containment, not efforts to achieve regime change. Proliferation prevention by means of bombing runs can provide short-term gains, followed by long-term costs. Combat air patrols to protect civilians from regimes that engage in mass murder can help turn the tide, but not affect the character of governance once the regime falls. None of the decisions relating to Iran, Syria, and North Korea are slam dunks. What these cases have in common is the need to avoid the fallacy of the last move, and to think instead about how US military action, once undertaken, would likely play out over time. Since 1945, the United States has generally failed to end wars victoriously and decisively — with the exception of the first Gulf war against Saddam Hussein and small-scale military operations like Grenada. Exit strategies have sometimes been embarrassing affairs in search of decent intervals. The worst of the lot was Vietnam. The image of a small helicopter air-lifting a few fortunate exit-seekers from a long line atop a building in Saigon is etched on my brain. It remains a haunting coda for a war waged to demonstrate resolve and inflict punishment. Fred’s lessons were embraced by the George H.W. Bush administration in the first Gulf war, and then forgotten by the George W. Bush administration in Afghanistan and in a second go-round with Saddam Hussein. Bush 43’s “War on Terror” was a rallying cry, not a strategy. It violated all of Fred’s dicta by being open-ended, geographically unbounded, and at odds with a declaration of mission accomplished. President Barack Obama wisely re-framed this contest as the disruption and defeat of the core al-Qaeda leadership — achievable war aims. Then he muddled US objectives by extending the conflict to include al-Qaeda’s “affiliates” and “associates.” Drone strikes have become one yardstick to measure the extent to which the Obama administration has strayed from Fred’s criteria. The US exit strategy in Iraq was incomparably better than in Vietnam, but the price of regime change has been very steep, and Iraq’s future is uncertain, at best. The outcome in Afghanistan is yet to be determined, but may well look depressingly familiar. After expressing confident expectations about fighting wars in Afghanistan and Iraq, hawkish US analysts and politicians owe their fellow citizens something more than new military action plans. For a start, they might explain how their new proposals for the use of force meet Fred’s criteria. Humanitarian interventionists who wish to place US forces in harm’s way are similarly obliged to clarify aims and projected costs. Has the nature of war changed so much as to make Fred Iklé’s criteria irrelevant? If only I could emphasize the end. These modern, “4th generation” conflicts are too complex, in terms of parameters and sociopolitical forces, to get precisely the correct information to apply the correct amount of force in the correct location to bring a conflict to a peaceful equilibrium. In traditional warfare, the parameters and forces are more finite. The enemy is generally distinguishable as are the fronts, objectives, etc except for a few heterodox elements. 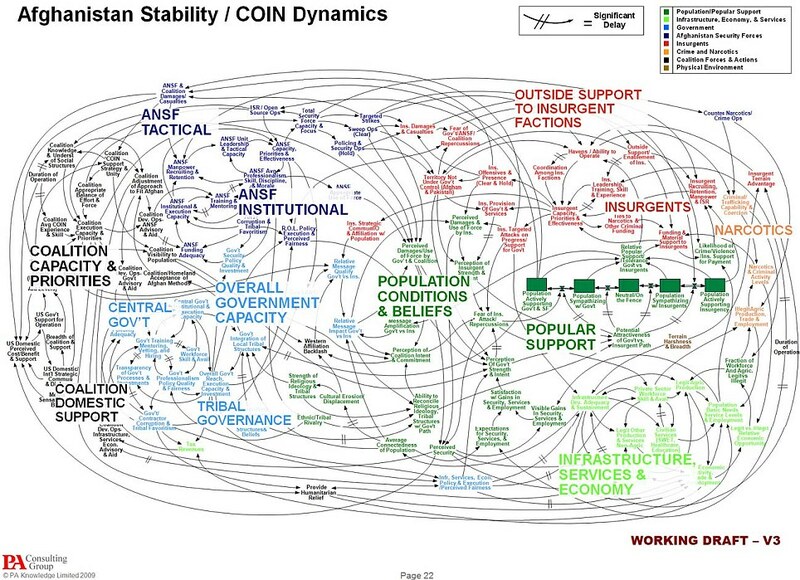 Modern examples like Iraq and Afghanistan, wherein a power vacuum was created allowing many unique low-level conflicts to happen simultaneous, creating a space wherein distinguishing cause and effect of specific and potential engagements is a daunting challenge. Even some good attempts (e.g. http://i.dailymail.co.uk/i/pix/2010/04/28/article-0-09562375000005DC-283_964x699.jpg – which was chided by many despite being an important effort) can fall short in how they may be exercised if only for fog of war. Mistakes in planning or execution may cause unintended consequences far worse than otherwise. Drone strikes are precisely the Obama administration’s attempt at engaging the enemy in a surgical, single-dimensional way, as to limit unintended consequences. But the sociopolitical impacts of the strikes, transcending the military theater, may (and in my opinion do) serve to only worsen our strategic outlook. Without much defense, I offer that the best way to win is to not play at all. Use soft power and honest diplomacy in nation building as to only provide low impact perturbations to systems in equilibrium to achieve specific strategic, foreign policy goals. Issues like blowback and unpredictable chaotic behavior are minimized. Of course for politicians on a 2/4/6-year election cycle, strategic thought isn’t a strong suit. Not playing has its attractions, as you note. Others may continue to play (say N. Korea vs. Japan), so we just let them fight it out or not, nuclear weapons and all? And then there is the occasional evil tyrant who seems too heinous to ignore. Great picture. I have a friend who was on one of the aircraft carriers to which those helicopters flew. He told me that they did not have room on the flight deck as more ‘copters came in, so they just lined up and pushed helicopter after helicopter into the ocean. My thanks to Josh for posting this pic. The types of war have NOT changed – its the evolution of warfighting that creates illusions among the more powerful military powers that result in their failures to deliver. Semantics notwithstanding the principles of war – i.e. the 10 Commandments, are as sound today as they were centuries ago. The illusions of infallibility tend to detract from these Principles. Fred Charles Iklé understood this truth and recognised the three “musts” – something the American political and military leaders sadly ignored after their phenomenal victory in 1945. All of this assumes that America’s wars are all “wars of choice”. True, America doesn’t face any existential threats, but some of its allies might – are you saying that it should simply abandon them if making war in their defence doesn’t meet these narrow dicta? For example, after the dissmisal of MacArthur, the UN forces didn’t have any strategy for defeating the communist forces on the Korean peninsula. Instead, their strategy was simply to stand on the defensive until such a time as peace could be made – the Korean stalemate could have gone on for much, much longer – but aren’t both the US and South Korea much better off for having stood firm? Really, these dicata could be summed up in a single sentence – “The United States should only fight wars that it knows it’s going to decisively win before hand” – but history shows how rarely this may actually be the case, even where war is entirely justified. The UK’s declaration of war on Germany in 1939, for example, would not have happened had they followed these dicta. UK+France v. Germany is a particularly interesting case in that the Allies not only didn’t have a plan for how to end the war, they didn’t even have a plan for how to start it. And, particularly after the fall of France, there was certainly a high probability that the war would turn into an enduring stalemate across the English Channel – possibly with ongoing aerial bombardment of cities. So, yes, I am very glad that nations sometimes enter the bloodiest of wars without a hint of an exit strategy. What we need, is better guidance as to when this is the right thing to do and when it isn’t. Saying that the nature war hasn’t changed is like saying that the nature of cooking hasn’t changed. The changes aren’t just advances in technology, they reflect fundamental changes in human culture. In the 15th century, Florence fought for years against Pisa, thirty miles away. That’s the distance as sepaates Seattle from Tacoma. Back then, it was considered normal: scads of such wars happened between cities and between tribes. Today, they’re unimaginable except in a few particularly benighted backwaters. Back in the day, wars were absolutely about killing people. Today, the importance of killing is in decline. Gandhi understood that India could win by making a point of not killing the British: his technique has become the most popular and most effective method of overthrowing a government. The Vietnamese didn’t follow Gandhi, but they understood that they could win by just exhausting our patience. They could endure a kill ration 30:1 against them. Eventually, we got tired and went home. Today, even more than in Vietnam, information predominates. Al Qaida has never had more than the equivalent of a few divisions, and it’s troops are without airpower, deficient in firepower, and lacking in most of the rest of what America considers necessary, but they have never been without the communications technology needed to generate headlines and, more recently, tweets. Until recently, a nation’s military potential was determined, in large part, by how many young men it had. Today, it is well understood that one of the best ways to prevent a war is to educate little girls. Such a concept would never have occured to Napoleon, or the Duke of Wellington. In today’s world, discounting the importance of prevention is a calamitous mistake. Instead of there being “no substitute for victory”, in the modern era victory is usually a pretty poor option compared to a strategy that means never having to fight. As human culture changes, so do all our institutions, including war. The Vectren Dayton Air Show canceled a re-enactment of a World War II atomic bomb attack on Japan after protesters launched an online petition Wednesday. The June 22-23 airshow at Dayton International Airport will keep the pyrotechnic show dubbed “the Great Wall of Fire,” but as a separate event not tied to the Aug. 6, 1945, attack on Hiroshima, said Terry Grevious, air show executive director. When Britain entered the war, when France fell and Britain fought on alone, when farmers with shotguns were mobilized to fend off Germans with panzers, when a thousand Hurricanes and Spitfires fell over the Channel and a thousand British freighters sank in the Atlantic, when London and Coventry and Manchester burned and Britain still fought on, the Red Army was on Hitler’s side. What, then, was Britain’s “exit strategy”? My Grandfather was a Rat of Tobruk. The Seige summed up that whole bloody period – outclassed, outgunned, and no real chance of victory, but fighting on anyway. Sometimes ‘holding on and waiting for the other side to self-destruct’ is the only strategy you have left. the scenario was the Soviets doing the Fighting and the Western Allies doing the sitting. A for morality ,a qaint concept , the British government didn’t show to much moral pangs giving the Czechs away .